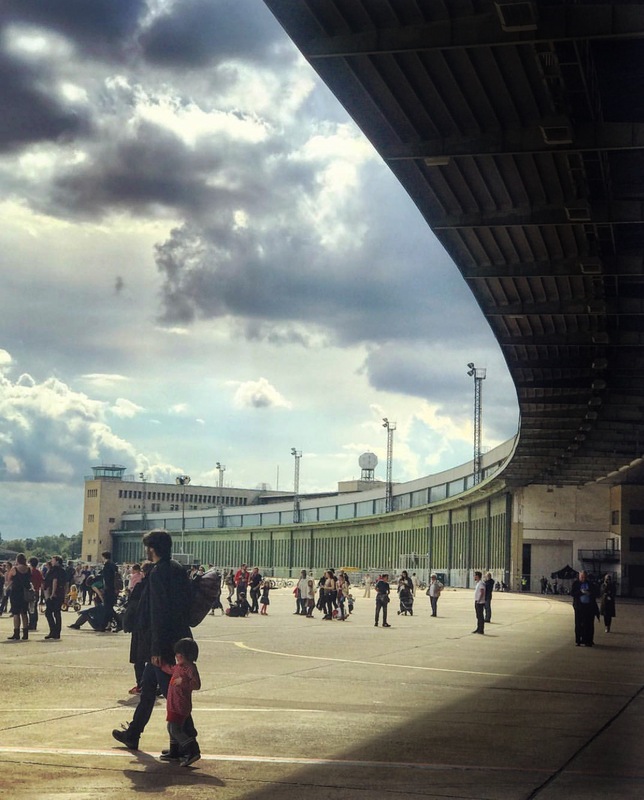 If you’ve lived in Berlin long enough, you’ve no doubt been to Tempelhofer Feld – a sprawling public park that’s especially popular in the summer and a ‘must-see’ spot in the city. But what about that huge building on the horizon? 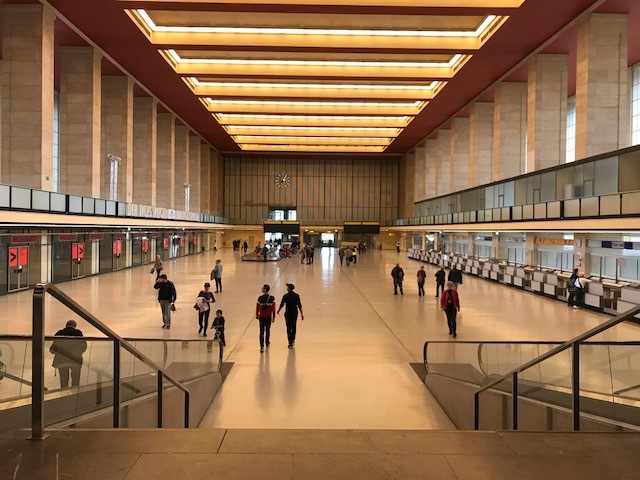 This striking display of architecture is a symbol of Berlin’s eventful history, otherwise known as Flughafen Berlin-Tempelhof (or Berlin Tempelhof Airport) and the field is actually the old runway and a part of the main terminal building. Its distinctive Neoclassical, Nazi architecture style is very imposing and makes for some monumental viewing. It no longer functions as a working airport and is now a protected monument, however parts of the building are open to the public through guided tours, and so we spent two hours on one of them to get a look behind the scenes and hear for ourselves just how this historical landmark came to be – the time flew by (ahem). Our guide was very knowledgeable (as you’d expect from a tour guide!) but also explained things interestingly and enthusiastically, answering questions as we went and allowing for all the picture taking. 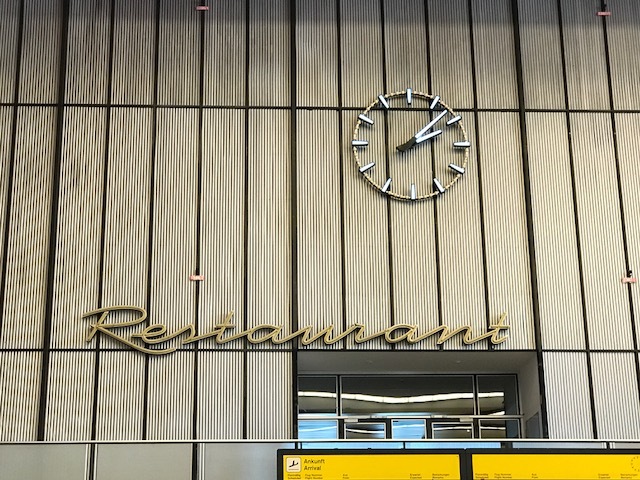 Tempelhof officially became an airport on 8 October 1923 and the old terminal was built in 1927. Before that, it was used as a parade field by Prussian and then German forces until the start of World War I. 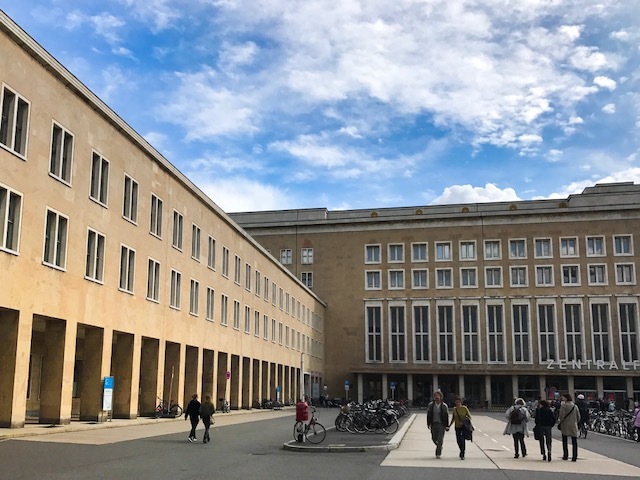 In the mid-1930s, the Nazi government became interested in the site and so began a massive reconstruction of the terminal with dreams of making it “the gateway to Europe” – this structure remains today. Due to its central location and size, it soon became one of the world’s busiest airports (see, we did pay attention!). You can check out some of its history in pictures here. Once inside we got a look at the old canteens, luggage belts, hangars and main lounge (complete with check-in desks), the lounge truly displaying one of the variety of styles the airport has experienced in its 70+ year history. This room also features a large mural depicting the famous Berlin Airlift. Western allies helped sustain the city’s residents after World War II by carrying food and other essential supplies into Tempelhof and so-called ‘Candy Bombers’ dropped parcels of sweets to eagerly awaiting children. A pilot named Gail Halvorsen started to notice that children were always lingering near the fence of the airport and wanted to give them some treats, soon after other pilots started following suit and the rest is history. Although a lot of the rooms were not accessible to us, you get a real feel of how enormous the complex is and it takes some time to get around the place. Below ground we walked through tunnels of bunkers which were used by Berlin’s inhabitants while the city was under attack in the second World War. With the doors closed, you get a real sense of how terrifying it must have been down there in a windowless room full of people while the fighting was going on above. Some of the walls feature popular cartoon characters of that time used to keep the children calm. We also came across a film and archive bunker which was badly damaged by fire towards the end of the war, destroying important documents inside. There are different theories as to how the fire was started, some sites claim it was started when the Soviet forces stormed the building during the Battle of Berlin using grenades to break open the sealed doors. Others claim it was German soldiers destroying evidence… either way, it unfortunately led to this great fire and the loss of important archives. Outside we had a look at the impressive airfield, featuring an example of a US Air Force plane, the type used during the Berlin Airlift. When the reunification of Germany happened in 1990, the presence of the American forces in Berlin who had been there since the Soviet’s handed it over to them in 1945 as part of the “American occupation sector of Berlin” came to an end. The halt of the U.S Army’s presence ended a 49-year American military presence in Berlin. The plane is housed underneath a massive, canopy-style roof which was apparently intended to hold some stadium-like seating, though this was never completed. From the top of the roof, you get to see Tempelhofer Feld in all its present-day glory and a better look at the radar tower, which is actually still used today by the German Military to monitor flight traffic. The airport closed in 2008, despite the efforts of some people who voted to keep it open. However in the end there just weren’t enough voters and operations were ceased. Nowadays, apart from the tours the main tenants of the building are the Polizei who occupy about 15% of the space. The site is also host to numerous fairs and events, including music festivals, sporting events and since 2015 is home to a large refugee camp. People use the field surrounding the terminal as a place to relax, fly kites, ride bikes and have barbecues. 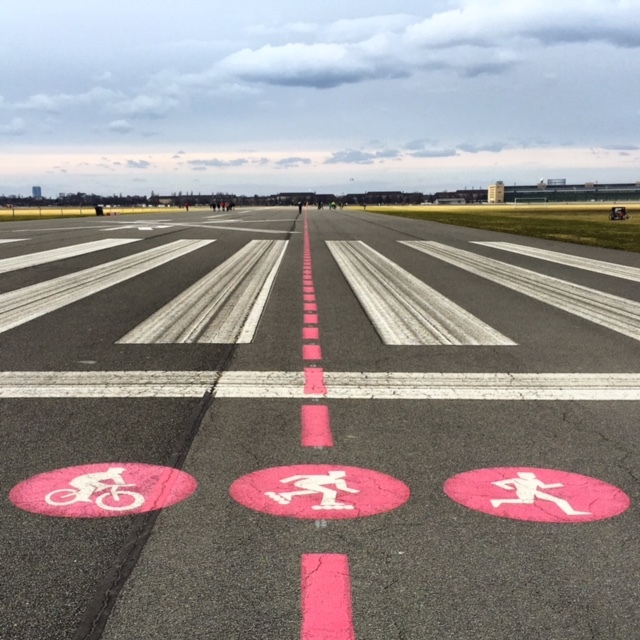 Find out more about what you can do at the Tempelhofer Feld here. 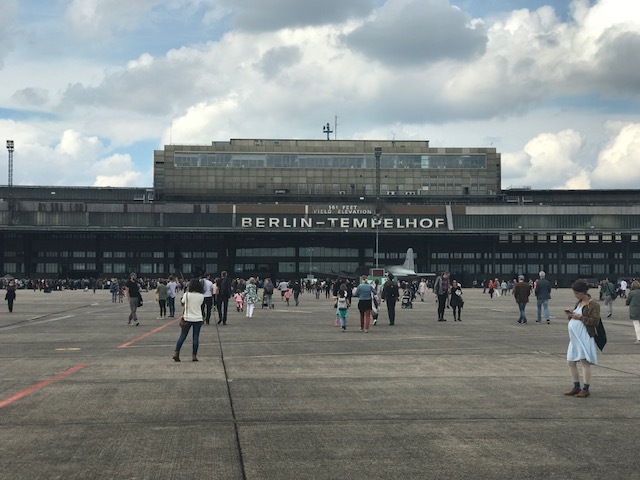 The field area has been at risk of being closed down in the past, but Berlin’s citizens were given a referendum and voted in favour of keeping it open as a public park, maintaining Tempelhof as a unique feature unlike in any other city. 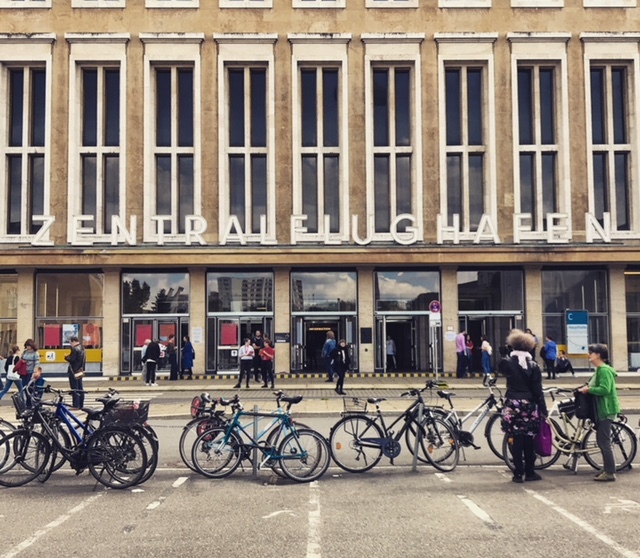 If you’re interested in finding out more about Tempelhof’s fascinating history then these tours are really recommended! Get all the info you need here. **This article was written by Natalie Lunt and edited by Tulio Edreira. Photos by Tulio Edreira. First time in Berlin? No problem. We got you covered!